Have you ever been a little nervous when you have to take the pooch to the vet or out to the deer stand and you don't want her inside the truck so she has to ride in the bed. Dogs can easily jump out or be thrown out in a sharp turn and this could result in expensive and painful injury or even the death of your pet. Wouldn't it be better if you have a custom dog box to put her in. Keep her safe and out of the weather by treating her to some kind of shelter. 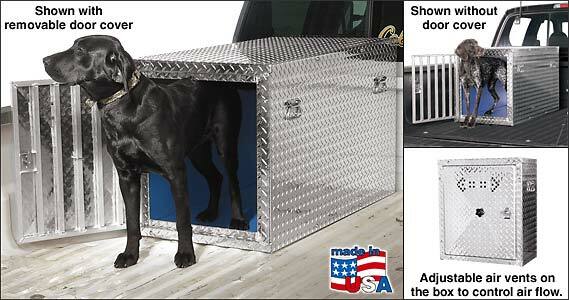 You could look for "dog boxes for sale" signs or buy diamond plate dog boxes online. I'd hate to have to come home and tell my daughter that her dog jumped out of the truck and broke three of her legs. This box is light weight and wont rust or rot like steel frame or wooden dog boxes. A bed mat might be needed to protect your pickup bed when hauling any hunting dog boxes. The paint may be scratched and lower the value of your truck. For those of you with tonneau covers, some of these boxes can be laid sideways and still fit under your cover. Nice to know if you get in inclimate weather and BOBO would rather lay down dry than stand up wet. A camper shell can be used as the perfect way to take Fido anywhere he wants to go. They love it when your camper has the optional front slider so he can jump up front when he wants too. The great looks of a topper plus the added functionality of a pet carrier is a good combination and lets not forget about the gas mileage savings. Popular Mechanics showed us way back in 1982 that you could increase your mileage by 13% with the addition of a truck topper. 9% with a tonneau cover.